George Bernard Samways was born in early 1891 at West Coker. He was the son of leather dresser Benjamin 'Ben' Samways (1864-1932) and Mary Jane Adelaide née Rendell (b1866). Ben and Jane were to have three children; Annie (b1889), George and Vera (b1906). By 1901 the family had moved to 60 Queen Street but by the time of the 1911 census they had moved to 27 Goldcroft. 19-year old George gave his occupation as an apprentice glove cutter. The family later moved to 22 Talbot Street. George enlisted at Yeovil in the spring of 1916, initially joining the North Somerset Yeomanry with the Service Number 2284. He was soon transferred to the 1st Battalion, Duke of Cornwall's Light Infantry with the new Service Number 29450. At the outbreak of war the 1st Battalion were stationed at Curragh as part of the 14th Brigade of the 5th Division. They mobilised on 15 August 1914 and landed at Le Havre. The battalion engaged in various actions on the Western front including (in 1914) the Battle of Mons and subsequent retreat, the Battle of Le Cateau and the Affair of Crepy-en-Valois, the Battle of the Marne, the Battle of the Aisne, the Battles of La Bassee and Messines and the First Battle of Ypres. In 1915 the battalion were engaged in the Second Battle of Ypres and the Capture of Hill 60. On 12 January 1916 the 14th Brigade became the 95th Brigade of the same Division. In 1916 the 1st Battalion, Duke of Cornwall's Light Infantry were involved in the Attacks on High Wood and the Battle of Guillemont. It is likely that George joined his battalion at the Front in time to join the Battle of Flers-Courcelette. The Battle of Flers–Courcelette was a battle within the Somme Offensive, launched on 15 September 1916 with the battle continuing for a week. Flers–Courcelette began with the objective of cutting a hole in the German line by using massed artillery and infantry attacks. This hole would then be exploited with the use of cavalry. It was the third and final general offensive mounted by the British Army during the Battle of the Somme. By its conclusion on 22 September, the strategic objective of a breakthrough had not been achieved; however tactical gains were made in the capture of the villages of Courcelette, Martinpuich and Flers. In some places, the front lines were advanced by over 2,500 yards (2,300 m) by the Allied attacks. The battle is significant for the first use of the tank in warfare. It also marked the debut of the Canadian and New Zealand Divisions on the Somme battlefield. Within a couple of days, the battalion was in action again. The Battle of Morval, 25–28 September 1916, was an attack during the Battle of the Somme by the British Fourth Army on the villages of Morval, Gueudecourt and Lesbœufs held by the German 1st Army, which had been the final objectives of the Battle of Flers–Courcelette. The main British attack was postponed, to combine with attacks by the French Sixth Army on the village of Combles south of Morval, to close up to the German defences between Moislains and Le Transloy, near the Péronne–Bapaume road. The combined attack from the Somme river northwards to Martinpuich on the Albert–Bapaume road, was also intended to deprive the German defenders further west near Thiepval of reinforcements, before an attack by the Reserve Army, due on 26 September. The postponement was extended from 21–25 September because of rain, which affected operations more frequently during September. Combles, Morval, Lesbœufs and Gueudecourt were captured and many casualties inflicted on the Germans; the capture of Lesbœufs was the action the 4th Battalion took part in. The Fourth Army advance on 25 September was its deepest since 14 July and left the Germans in severe difficulties, particularly in a salient which developed to the north-east of Combles. Tiredness and lack of reserves prevented the Fourth Army exploiting its success beyond patrolling and cavalry probes. Deteriorating weather and the shorter days greatly increased British and French transport difficulties; rain and fog grounded aircraft and impeded artillery observation. Mud reduced the blast effect of shells and immobilised infantry, which was an advantage to the defenders. A small number of tanks joined in the battle later in the afternoon, after having been held back because of the later start and reduced a number of German strong points which had withstood earlier attacks. Within a week the battalion was in action again, taking part in the Battle of Le Transloy Ridges (1 to 18 October 1916). The Battle of Le Transloy began in good weather and Le Sars was captured on 7 October. Pauses were made from 8–11 October due to rain and 13–18 October to allow time for a methodical bombardment, when it became clear that the German defence had recovered from earlier defeats. Haig consulted with the army commanders and on 17 October reduced the scope of operations by cancelling the Third Army plans and reducing the Reserve Army and Fourth Army attacks to limited operations in co-operation with the French Sixth Army. Another pause followed before operations resumed on 23 October on the northern flank of the Fourth Army, with a delay during more bad weather on the right flank of the Fourth Army and on the French Sixth Army front, until 5 November. Next day the Fourth Army ceased offensive operations except for small attacks intended to improve positions and divert German attention from attacks being made by the Reserve / Fifth Army. The first action the 1st Battalion saw in 1917 was the Battle of Vimy Ridge. This was a military engagement fought primarily as part of the Battle of Arras, in the Nord-Pas-de-Calais region of France. The main combatants were the Canadian Corps, of four divisions, against three divisions of the German Sixth Army. The battle, which took place from 9 to 12 April 1917, was part of the opening phase of the British-led Battle of Arras, a diversionary attack for the French Nivelle Offensive. After Vimy Ridge was captured by the Canadians on 9 April 1917, other units took over and by 13 April the 5th Division relieved them and took over what had been taken. Hostilities were resumed here on 23 April 1916 when the 15th Brigade were ordered to capture German positions in front of La Coulotte. On 23 April 1917, the 1st Battalion were involved in this subsidiary attack on La Coulotte. The Third Battle of the Scarpe, the last of the Battles of Arras, 1917, which opened on 3 May, was of a similar nature to the operations of April. The French had planned a heavy attack on Chemin des Dames to take place on the 5th and, in order to distract the attention of the enemy and hold his troops east of Arras, Sir Douglas Haig considerably extended his active front. While the Third and First Armies attacked from Fontaine-les-Croisilles to Fresnoy the Fifth Army was to launch a second attack upon the Hindenburg Line in the neighbourhood of Bullecourt - a total of over 16 miles. Zero hour was timed for 3:45am on 3 May. The Battle of Polygon Wood, 25-27 September 1917, was part of the wider Third Battle of Ypres. It came during the second phase of the battle, in which General Herbert Plumer’s Second Army was given the lead. Plumer replaced the ambitious general assaults that had begun the battle with a series of small attacks with limited objectives – his “bite and hold” plan. These attacks involved a long artillery bombardment followed by an attack on a narrow front (2,000 yards wide at Polygon Wood). The attacks were led by lines of skirmishers, followed by small infantry groups. German strong points were to be outflanked rather than assaulted. Each advance would stop after it had moved forward 1,000-1,500 yards. Preparations were then made to fight off any German counterattack. The attack on Polygon Wood was the second of Plumer’s “bite and hold” attacks, after Menin Road. It was carried out chiefly by the 4th and 5th Australian Divisions but the 1st Battalion, Hampshires also played a part. The site of Polygon Wood was captured on 26 September, the target line on 27 September. The attack then stopped, and Plumer prepared for the next attack. The two Australian divisions lost 5,471 men during the Battle of Polygon Wood. The three “bite and hold” attacks brought the front line to the foot of the Passchendaele Ridge, which would be come the target of the First and Second Battles of Passchendaele, and give its name to the entire battle. The Battle of Poelcappelle (9 October 1917) marked the end of the string of highly successful British attacks in late September and early October 1917, during the Third Battle of Ypres. Only the supporting attack in the north achieved a substantial advance. On the main front the German defences withstood the limited amount of artillery fire managed by the British after the attack of 4 October. The ground along the main ridges had been severely damaged by shelling and rapidly deteriorated in the rains, which began again on 3 October, which in some areas turned the ground into a swamp. Dreadful ground conditions had more effect on the British, who needed to move large amounts of artillery and ammunition to support the next attack. The battle was a defensive success for the German army, although costly to both sides. The battalion also took part in the Second Battle of Passchendaele (26 October – 10 November 1917), another phase of the Third Battle of Ypres. The battle took place in the Ypres Salient area of the Western Front, in and around the Belgian town of Passchendaele. In December 1917 the 1st Battalion was deployed to Italy to strengthen Italian resistance after a recent disaster at the Battle of Caporetto. They were positioned along the River Piave. In April 1918 the battalion returned to France, arriving at Frevent. Almost immediately they were thrown into battle and saw fighting during the Battle of Hazebrouck (12 to 15 April 1918), a part of the wider Battle of the Lys, also known as the Lys Offensive or the Fourth Battle of Ypres. On 12 April, the Sixth Army renewed its attack in the south, towards the important supply centre of Hazebrouck, another 10 kilometres (6.2 mi) to the west. The Germans advanced some 2–4 kilometres (1.2–2.5 mi) and captured Merville. On 13 April they were stopped by the First Australian Division, which had been transferred to the area. The British Fourth Division defended Hinges Ridge, the Fifth Division held Nieppe Forest and the 33rd Division was also involved. The 1st Battalion, Duke of Cornwall's Light Infantry were occupying positions in the line near Nieppe Forest, and the battalion saw action on 25 April 1918. It is most likely that George Samways was seriously wounded in both feet during this action. He died from his wounds two days later, on 27 April 1918. He was 26 years old. 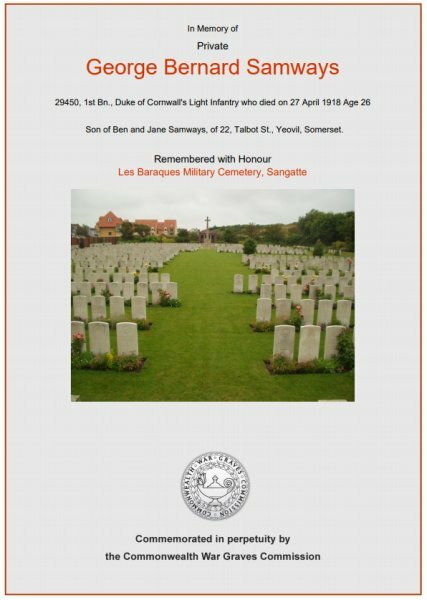 The Western Gazette, in its edition of 3 May 1918 reported "Private George Bernard Samways, of the Duke of Cornwall’s Light Infantry, son of Mr and Mrs Samways, of Woodland Grove, was wounded in both feet on Monday, the 29th. A later telegram, however, states that he is progressing favourably. Private Samways, who has been in the Army about two years, was first sent to France, and next to Italy, afterwards returning to France. In the edition of 10 May 1918, the Western Gazette further reported "Private GB Samways, of the Duke of Cornwall’s Light Infantry, who was reported wounded last week, has died from wounds received in action on April 27th." George was interred in Les Baraques Military Cemetery, Sangatte, Pas-de-Calais, France - Grave III.E.11A - and his name is inscribed on the War Memorial in the Borough. The Commonwealth War Graves Commission certificate in memory of George Samways. 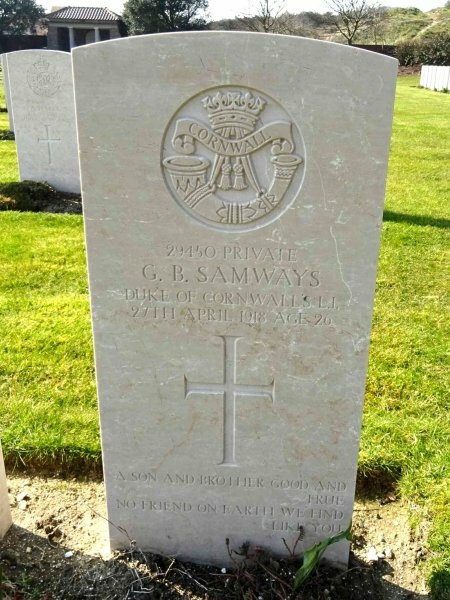 George Samways' Commonwealth War Graves Commission headstone.